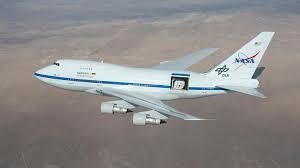 SOFIA - NASA's Stratospheric Observatory for Infrared Astronomy - is a unique and rather amazing resource for science. Operated for NASA by the Universities Space Research Association (USRA), it's been flying since 2010. It carries a 2.5m infrared telescope exposed by opening an access door in the portside rear fuselage. In January 2017, NASA published the first image from an upgraded instrument, the High-resolution Airborne Wideband Camera-plus (HAWC+). My college friend, Elizabeth Ruth, is one of the pilots for SOFIA. Since she's she also a very smart and inquisitive person, I thought she also would be the right pilot to ask about how this singular instrument and its carrier aircraft are operated. Take it away, Liz. 1. You were an Air Force and airline pilot, then you didn’t fly for a few years. Can you briefly sketch your background and tell me what drew you back to pursue the SOFIA opportunity? I was lucky enough to grow up on a Navy base in the middle of the Mojave Desert (pretty counter-intuitive though that sounds) during the 1960’s and 70’s. I was surrounded by scientists, engineers and pilots, the skies were full of airplanes, and sonic booms were a daily occurrence. I wanted to fly as long as I can remember, and the doors to that opportunity opened for me at just at the right time. I went to college on an Air Force ROTC scholarship and attended pilot training after graduation. I flew for two tours in the Air Force and then left active duty to become a pilot at United Airlines. My husband, who was also an Air Force pilot, started flying for Delta Airlines at about the same time. I flew for United for 16 years, then retired early to stay home full-time to raise my three daughters. I knew that I would want to return to some kind of work once my girls went to college, but though I missed flying, I did not intend to return to the airlines. The seniority system they use meant I would have to start all over at the bottom, which I was not willing to do. I worked in a couple of office jobs and quickly learned that a Monday-Friday, 9-5 desk job was not inspiring to me at all. I felt I should be able to make a better contribution that took advantage of all my training and years of flying experience. Serendipitously, I ran into a NASA pilot while I was traveling. We struck up a conversation and he told me about the positions at the Armstrong Center, including flying SOFIA. He said they were always looking for part-time pilots who have a military background and experience flying heavy airplanes. I knew instantly that this would be a dream job for me, and I met all the qualifications. Who wouldn’t want to work for NASA? He told me how to apply, we kept in contact, and a position came open. I had several interviews and a flight check ride and got the job. Once I was hired, I went through several months of training and now I am a type-rated 747 pilot checked out on SOFIA. So now I am back to where my dreams began—in the California desert, surrounded by scientists, engineers and pilots. I have had several cool jobs throughout my career, but this one is the absolute best. 2. Had you flown the 747 before? Does it handle as nicely as most pilots I’ve read articles by say it does? Yes it does! During my flying career in the Air Force and at United Airlines, I have flown most of the Boeing aircraft models—737, 757, 767 and 777. Though I always wanted to fly a 747, it just never worked into my schedule at United, so I am thrilled to get the opportunity now. SOFIA is a 747 SP. The SP officially stands for Special Performance but we call it the “Sport Model” . I would say that SOFIA flies like a big 737-200. It has plenty of power, no real quirks, and is very responsive. It is an extremely well designed airplane that has stood the test of time. I don’t know of any pilots who don’t love it. 3. That telescope mount is pretty massive. How dies it affect the flying qualities of the aircraft, especially with the aperture open? Believe it or not, we can’t even tell in the cockpit when the door is open or closed. We can’t even feel when it is in transit. This is another exceptionally well-designed piece of machinery. 4. Can you describe for me the typical mission? How much science time do you get in, and how long is the entire effort, from arriving at the airport to departing? It’s a very long night! The start time depends on what is being viewed that night, but typically we will take off shortly after sunset and land sometime before sunrise, with the actual flying time usually being somewhere between 9 – 10 hours. The preparation for the flight starts much earlier, of course. Takeoff minus 3 hours: Crew Show and Briefing. The crew show time is 3 hours before takeoff time. We each individually review the flight plan and conditions for the night, then we conduct a formal flight crew briefing, which includes the pilot, copilot, flight engineer, flight safety technicians, flight operations engineer, mission planner, meteorologist and a representative for the mission director. We go over the status of the airplane, the flight plan specifics and the weather along the route. We make plans for contingencies such as aircraft or telescope malfunctions. The timing at each point is critical, so we also figure out if we can make any adjustments for a late takeoff. This will depend on the science priorities for the mission. Takeoff minus 2 hours: Mission Briefing. The next step is the mission briefing, which includes the entire crew for the mission as well as the planners, engineers and meteorologists. We cover some of the same information for the scientists as we did in the aircrew brief, along with additional information that is crucial to them, such as the water vapor levels at each altitude. The scientists brief us on exactly what they are looking for with their instruments on each leg and which legs have priority if we have to make any adjustments for weather. Takeoff minus 1 hour: Preflight and start. We all head out to the aircraft to preflight and prepare our respective equipment. The flight crew coordinates with the Mission Director every step along the way to make sure we are keeping on time. We close doors and start engines about 35 minutes before takeoff time to allow plenty of opportunity to troubleshoot any problems without delaying takeoff. We are usually the only airplane on the ground at Palmdale at that time of day, so there is typically no wait in getting a clearance for taxi. Takeoff: We let the tower controllers know our “wheels up” time so they can coordinate with ATC for us to get up and out as per our flight plan. A precise takeoff time is critical to the success of the mission. Climb out and level off: We work with ATC to climb without delay to our first altitude. This can be tricky if there is a lot of traffic around us, especially because we are not flying a normal kind of route, so we are crossing other airplanes’ paths. When we get straight and level, the mission crew runs the checklist with the flight engineer to open the door for the telescope. The first line of the flight is usually used to calibrate the equipment so they are ready for observations on the next line. Inflight: Once the equipment is calibrated and working well, the scientists will start making their observations. If all the weather conditions are right (no clouds at altitude and no excessive turbulence) they can get 8-9 hours of observations in. At the end of the last line of observations, we flight straight and level for 5 minutes to cage the telescope, then the pilots can begin descent for the approach and landing. Landing: After landing and taxi-in, the aircrew and mission crew depart the airplane and go to their respective offices to write reports. For the aircrew, these reports include filling out the electronic logbook for each of the crew members, talking to the mechanics and writing up any problems with the airplane, and writing a synopsis of overall success of the flight. This usually takes at least 30 minutes. All told, the time from show to go is typically 13-14 hours. 5. That’s not a new 747. How much effort does it take to keep it ready for these long missions? We have a crew of aircraft mechanics and specialists at the Armstrong Center who take care of all the airplanes in the fleet, including SOFIA. They are exceptionally knowledgeable and are very good at creative problem solving, which is helpful when you are working with a one-of-a-kind aircraft. One of the most challenging aspects of maintenance is finding spare parts for such an old model of airplane. They know every source possible, including mothballed airplanes that can be “cannibalized” for parts. Our operations engineers make sure SOFIA is safe and mission ready while making decisions that are efficient and cost effective. It is a constant effort that they take great pride in. 6. Do the pilots talk much with the scientists? Do scientists and technicians need to explain the telescope in detail to enable the flight crew to give them optimum conditions? The pilots brief with the scientists before each flight and we are in constant communication with the Mission Director throughout the flight. We are very cognizant of the conditions the scientists need for the telescope to work best. Mostly, we need to get as high as possible as soon as possible so we can get above as much of the water vapor in the atmosphere as we can for the most optimal infrared observations. There are constraints on the airplane, such as weight and air temperature considerations, that affect our ability to climb with a safe performance margin, and the pilots are constantly monitoring the conditions so we can climb as soon as it is safe. We are also on the lookout for any high-level clout tops, which would require closing the door to the telescope to protect it from moisture. Turbulence doesn’t affect the telescope as much as you would think because of the way it is designed. The assembly is mounted on bearings in pressurized oil, so it stays pretty stable during the bumps. In rough air, it can look like the telescope assembly is bouncing, but it’s really the airplane bouncing around the telescope. We have a carefully planned ground track, and we can’t deviate laterally without affecting the observations, so we work with ATC to make sure they don’t try to vector us off our heading. We are also constantly adjusting our airspeed and calibrating turns so that we stay within 2 minutes of the planned time at each point. We stay on headset with the Mission Director to coordinate all this with him or her. 7. Do you (or do flight crews in general) usually have a lot of curiosity about the science and keep track of what’s being produced in terms of scientific results? Some of the observations will contribute to projects that have a very long timeline, so it will be years before we know the results. That said, one of the astronomers on a flight last month said he was able to get the information he needed to publish a paper in the next few months, which will be fun to see. NASA is good about notifying us when something concrete is published. It’s pretty satisfying knowing that you played a part in a scientific discovery. 8. You started flying when it was very rare to see a woman in a military or airline cockpit. Are you the only woman flying SOFIA? Do you have an advice to young women about flying or science careers? I am still a bit of an oddity in the cockpit, even after all these years. 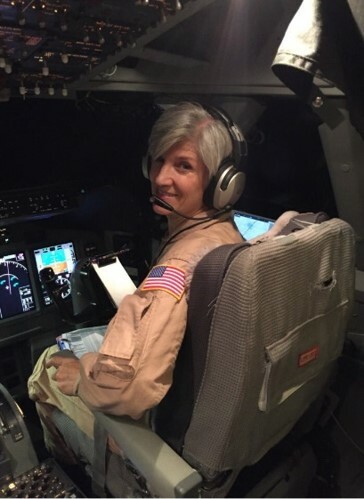 Right now, I am the only woman flying as a NASA Research Pilot at the Armstrong Center, out of about 30 total full-time and part time pilots who fly the various aircraft at the Center. This is actually close to the percentage of women flying professionally in the military and airlines at large, which has stayed around 4-5% over the last several decades. It’s a mystery to me why more women are not attracted to the aviation field, or to STEM fields in general. One of the best things about being a pilot is that you are measured against an objective standard, which doesn’t depend on who you are, but rather what you can do. Pilots value and respect performance, and they will give you your due if you can perform. There is a real advantage to operating in an environment like that. The pilots, crews and scientists have made me feel very welcome at Armstrong. There are plenty of women scientists and Mission Directors, and we are all just part of the team. My advice to young men and women is to follow what you love and find interesting. Dream and dream big—don’t put any limits on yourself. Someone is going to do the cool stuff, so why shouldn’t it be you? And then take the steps required to make that dream happen. My favorite part of each mission is the Mission Brief, because I get to see the enthusiasm of the scientists describing their projects. It’s exciting and energizing! You will find that the top two attributes of a satisfying job are People and Purpose. This job gets an A+ on both. And for those creative types out there, just know that technical jobs require a great deal of creativity, imagination and beauty, so don’t cross them off your list. If someone would like to talk to me more about my flying experiences, they can email me at Liz.Ruth@i3-corps.com. I am always happy to talk to students or anyone else interested in the flying world. I live in the San Luis Obispo area in California, which is on the coast halfway between Los Angeles and San Francisco. a huge informative. great work. And a new shark just swam in..
Manatees - Endangered or Threatened?